Red paint looks great in many rooms. But a bright, vibrant color like red can have poor covering power, which means more work for you to create the desired result. One of the best ways to improve the covering power is with a gray primer. The SureSwatch Primer Decider Scale shows you how to pick the right gray primer shade. You will do less work with less paint to achieve the color and the coverage you want with the best paint primer. With the Sure Swatch UNPRINTED side up, apply the paint generously in a corner-to-corner “X” pattern. Paint in a side-to-side motion and then in an up and down motion to completely cover the sheet. As a final step, roll in one direction from top to bottom in a series of strokes covering the entire sheet. Let the first coat dry until it feels dry to the touch. Apply a second coat using the same method. Again, be sure to let it dry to the touch. Drying time is approximately 20-60 minutes depending on the surrounding temperature and humidity. Crack SureSwatch on the dotted line to remove the Primer Decider. Flip the Primer Decider over and place gray squares to the sticky side of the painted SureSwatch. Remove remaining printed sheet. Place SureSwatch on the wall at approximately eye level or slightly above. Please don’t use this product on wallpaper, recently painted surfaces, unpainted drywall, or other easily peeled surfaces. 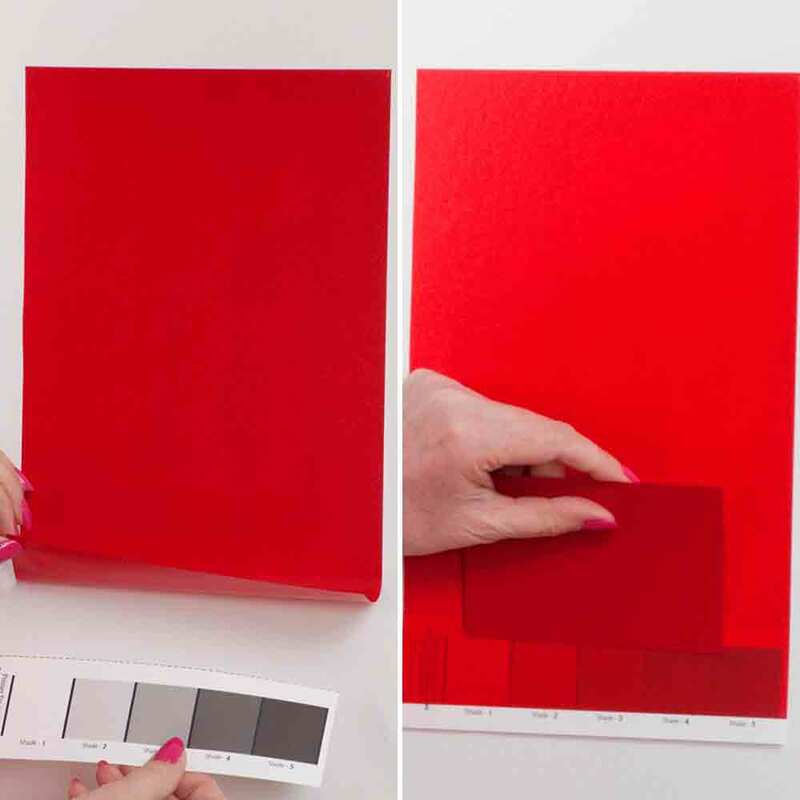 Compare the manufacturer’s color chip to each square of the covered Primer Decider. If no squares show through, no primer is needed. If the color looks best over a primer square, show that primer shade to a paint associate t get a similar tinted primer. Remove all the samples after viewing and discard. SureSwatch removes easily and cleanly. Be sure to remove within 14 days of viewing. Click here for a step-by-step video to help you use the SureSwatch Primer Decider Scale. Want more great ideas for painting with SureSwatch? Check out our painting tips for ideas and inspiration!